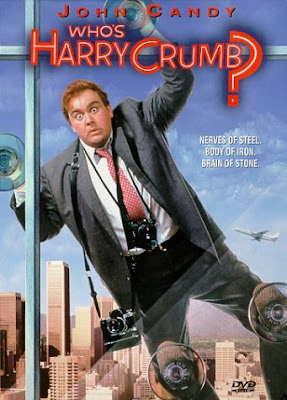 The return of Harry Crumb! Seen at CNBC. With the Dennis "the Real Deal" Kneale on CNBC reports! Unfortunately, Dennis will be right. Just like Harry Crumb, who was hired as a detective, because he would be the one that couldn't solve a kidnapping case because he was "a complete and utter idiot." But despite making all the wrong moves, all the wrong assumptions, and following all the wrong clues, Harry solves the case. And now, he has been reincarnated as Dennis Kneale, the likable but bumbling, but annoying, blogger basher with his own show on CNBC at the 8:00 pm time slot. Dennis, it appears, was being put out to pasture, so CNBC decided to make him a bull, and put him on his own show. It was a good excuse to get rid of him. But he'll succeed, despite CNBC's intentions, just like Harry Crumb did. Because the economy is turning up, the stock market is going higher, and the bearish pundits, and bearish bloggers, are just completely wrong. And whether the bloggers like it or not, Dennis is now CNBC's new face of the bulls. So think about that for a minute, all you who esteem yourself as intellectual masters of the market, and masters of this economy, and masters of the bloomberg, and masters of all your charting software, with the masterful interpretation of what that data means. If Dennis Kneale, can beat these bearish pundits at their game, what does that say for the intellectual rigour of those bearish, who can't see the coming economic upswing, or the next big move higher in the market? It looks like they met their match, with the "master of disguise!" And after INTC's better earnings tonight, it looks like the bears pores will be getting just a little bit tighter! Because when males of Cambarus bear pores, it is always upon the third leg! And that's where we are going. Because we are at the start of the third leg up in this market! The rally in healthcare has been outstanding but no one cares! 3rd leg up? when did we have the 2dn leg? By "my" definitions--from 830 to 940 after that consolidation. When additional ingredients are listed, yogurt becomes less healthy. sessions during the day. The first step of the diabetes diet plan supposes a fast weight reduction. Direct Edge defends the flash! All eyes on the start of the next bubble! Why are markets supposedly "stupid?" Don't let "they" do the thinking for you! Bears keep talking their book! SEC investigating Goldman's Sachs trading? Dennis Kneale: "No publicity is bad publicity!" Two weeks with Carnac the Magnificent! The bears are the market's black swan! Dow 9,000--Just a baby step! What happened to the cheap homes? What happened to the concrete stocks? Mishkin: Bernanke had "great courage"
Cash for the gold bugs! Where can the DOW go? Thar's gold in them hills!